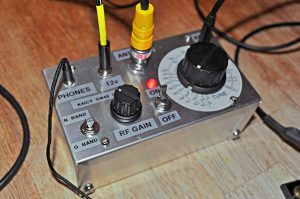 In amateur radio, QRP operation refers to transmitting at reduced power while attempting to maximize one’s effective range. The term QRP derives from the standard Q code used in radio communications, where “QRP” and “QRP?” are used to request, “Reduce power”, and ask “Should I reduce power?” respectively. The opposite of QRP is QRO, or high-power operation. Most amateur transceivers are capable of transmitting approximately 100 watts, but in some parts of the world, such as the U.S., amateurs can transmit up to 1,500 watts. QRP enthusiasts contend that this is not always necessary, and doing so wastes power, increases the likelihood of causing interference to nearby televisions, radios, and telephones and, for United States‘ amateurs, is incompatible with FCC Part 97 rule, which states that one must use “the minimum power necessary to carry out the desired communications”. The current record for a QRP connection is 1 µW for 2640 kilometers (1650 miles) on 10-meter band (28-29.7 MHz).